The location wars had a number of casualties. Some companies shut down, some sold off their remaining tech and talent. Others are still out there plugging away, but at this point, it seems clear that Foursquare won the all-important battle over the check-in. Even Facebook is slowly backing away from that particular space. Now the fun can really begin. For a number of months, Gowalla was seen as the main competitor to Foursquare. Both launched at SXSW in 2009 and both got quick traction as check-in services. But Gowalla was always trying to do more. Their experience came from the virtual goods side of things, and they tried to weave that into the location space. But it never really worked. Perhaps they were trying to do too much in the nascent space. Several months ago, the team sat down to dream it all up again. They thought about what kind of location-based app they would build today if they were starting from scratch. Then they went out and did just that. The result is the new Gowalla, which co-founder Josh Williams is showing off today at TechCrunch Disrupt. Technically version 4.0, the new version bears little resemblance to the previous versions of the app. Gowalla is no longer predominantly a check-in service. That’s still one aspect of it, but the idea is now to focus on two key areas: travel and storytelling. When you load up Gowalla, the first thing you see is still a main activity feed. Here you’ll find the activity from your friends. Because Gowalla isn’t completely pivoting away from their core location functionality, much of the data and social connections remain intact. But instead of a stream of check-ins, you’ll notice people hanging out together. They’re checking-in, but they’re also taking pictures and talking to one another in clusters that are known as “Stories”. The main middle tab is now “Guides”. Here you’ll find curated travel guides for various places around the world. For example, if you load up the app in San Francisco, you’ll see the San Francisco guide, as well as the East Bay guide and the Stanford guide. You can quickly scroll through other guides not near you as well. And Gowalla has the ability to make special guides on the fly. 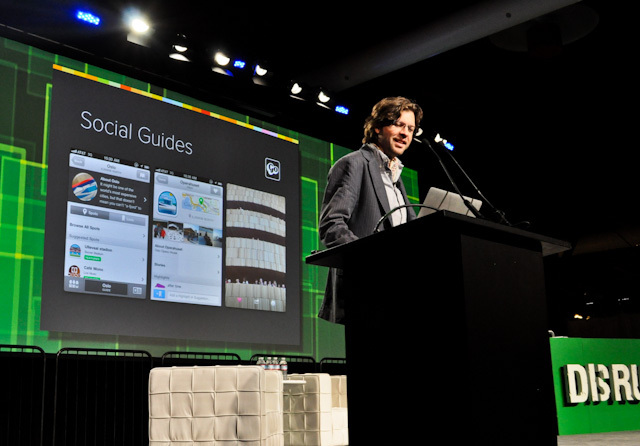 For example, they made a TC Disrupt guide for event-goers. Clicking on these guides loads up a bit of information about the city as well as all of the must-see spots. Again, because Gowalla has years worth of location data, they’re able to easily populate robust guides. Some of the locations are curated, some are based on check-in data and people favoriting places. The Gowalla “Highlights” feature also plays a role here. The final tab is your personal profile area. Here you’ll find all of your pictures and all of your Stories. So will this small pivot work for Gowalla? Well, they’re certainly focusing on the right areas. Check-ins are now a commodity, the real value of location lies in both augmenting personal experiences and providing useful information. Gowalla is trying to find the sweet spot between both. They’re a mobile travel guide and a well-conceived location-based sharing tool. Color, for all its faults, was trying to do something interesting around location-based sharing. This new version of Gowalla is doing something similar, but in a much more straightforward manner. You and all of your friends can take pictures at an event, cluster them together around location, and the UI to do so is obvious. You can also share all of this data to Facebook and Twitter — and yes, you can still check-in through Gowalla and send it to Foursquare. The travel aspect is potentially even bigger. While there are a lot of people going after this problem, no one has nailed the mobile travel guide so far. When someone does, it’s going to be massive. Gowalla has a pretty decent shot of doing something unique here because of all the data they’ve been collecting over time. Gowalla also has some key partnerships with Disney for these travel guides. Other launch partners include National Geographic and several major U.S. universities. Gowalla will feature guides for around 60 major metropolitan areas around the world at launch. The company has built apps for Android and iOS, and they have a web experience as well. All of them should be out shortly. We’ll see if Gowalla can do more this time beyond building a beautiful-looking app. But all of this new stuff sounds about right to me.